Shoji Matsumoto was born and raised in Hitoyoshi in the southern part of Kumamoto Prefecture on the island of Kyushu in Japan. 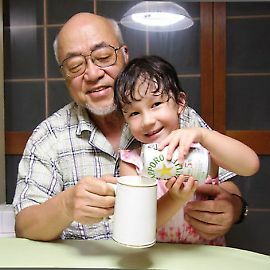 When he joined Joy o' Kanji mid-2011, he was 76 years young. He graduated from the English and American Department of Tokyo University of Foreign Studies, where he minored in social psychology. While working in several fields, including international banking, manufacturing, and hotel management, he lived in New York (6 years), Hong Kong (4 years), Bangkok (10 months), and Orléans, France (7 months), in that order. These earlier careers enabled him to discover his lifelong passion for translating (Japanese to English and vice versa) and writing. In addition to contributing occasional essays to local and industrial magazines, he has written a biweekly column for his hometown newspaper for more than three years. This series of essays, "English Lesson MERRY-Go-Round," combines Japanese and English. Those who don’t like English can still enjoy the Japanese parts of his stories. He's also a member of the Haiku International Association in Japan, among other organizations. His experiences in writing and translating have nourished his passion for his mother tongue, especially for kanji. He has two favorite kanji. The first is the non-Joyo 圭 （ケイ: gem of ancient China） because this shape contains 11 （十一） twice. That's significant to Shoji because his birthday is November 11. In fact, his pen name is 圭生 (けいせい), which means “born on November 11.” His second favorite kanji is 緑 （みどり: green) because that was the given name of his first love. He drew the character more often than any others, especially in letters that never reached her because they went straight into the wastebasket.